Ponds are an ecosystem, a geographical feature and a manageable resource. Dredging a pond has to take all of these things plus your municipal zoning rules into consideration. While it may seem like a simple matter of dredging your own pond on your own property, sticky laws in regards to water tables and wetlands sometimes make this a not-so-simple process. Add to that the depth and nature of your pond, and dredging can be quite involved. 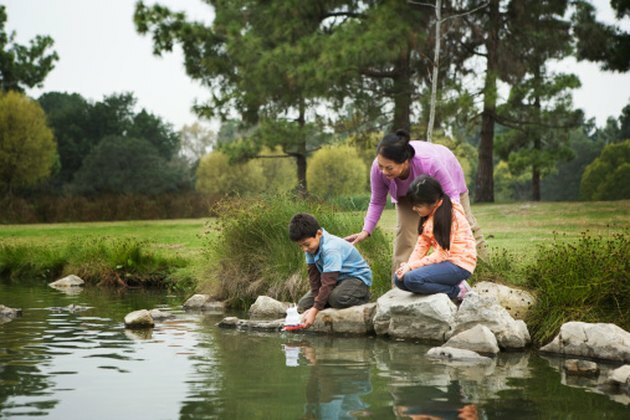 Depending on the size of your pond and your needs, there are a variety of methods to get the job done. Creating the ideal pond on your property may require renovating it by dredging. Wade into the pond to clear it by hand if the structure is shallow and the silt to be removed is minimal. Put on the waders to do this job. Use either hip waders or full waders, depending on the depth you need to access. Rake the bottom of the pond to remove vegetation. Rake in a regular pattern so you cover the entire bottom and don't miss any patches. Starting in the center and raking out in a spoke pattern is a good method. Work in clockwise fashion so you cover the entire bottom. Drag the vegetation to the shore and spread it to dry before hauling it away. The dried vegetation can be composted. Scrape the silt off the bottom of the pond with a shovel and deposit it in the wheelbarrow. Take care not to dig too deeply unless you desire to increase the depth of the pond past the built-up silt layer. The silt will feel soft and mucky, as opposed to the true bottom of the pond, which will be thick mud that gives some resistance when the shovel contacts it. Mix the dredged silt with compost or other soil to re-use the material. Do not just deposit it on the bank of the pond; silt is light and is not true soil, so it will wash right back into the pond with any rainfall. Attach a heavy-duty steel cable to a 55-gallon metal drum with a lid. Drill a large number of holes in the lid of the barrel with a 3/8-inch to 5/8-inch bit. Secure the cable to a bobcat, or to the ball of a tow hitch on a truck. Use the machine to drag the barrel back and forth across the pond. The barrel scrapes silt as it goes across the bottom, and the water escapes through the lid. Empty the bucket after it is no more than half full. At first, this will be after each pass; eventually, you will need to empty the bucket every few passes as you collect most of the silt from the bottom. Drain the pond using the pump to expose the bottom surface of the pond. Direct the flow of water toward an area that can accept the water without flooding any roads, driveways or other features. Do not drain the water into a sewer system or other waterway, such as a local stream. Allow the pond bed to dry out so the machinery does not become stuck while cleaning out the silt. Scrape the bottom of the pond with the excavating blade. Remove the silt and relocate it to another area where it can be mixed with soil so it does not recontaminate the pond. When the bottom is cleared of silt and debris, refill the pond.